Army Wants Further Study Of Dakota Access Pipeline Route : The Two-Way The Army Corps of Engineers reviewed the pipeline route after members of the Standing Rock Sioux tribe protested its construction. Going forward, the Army invited input from the tribe. 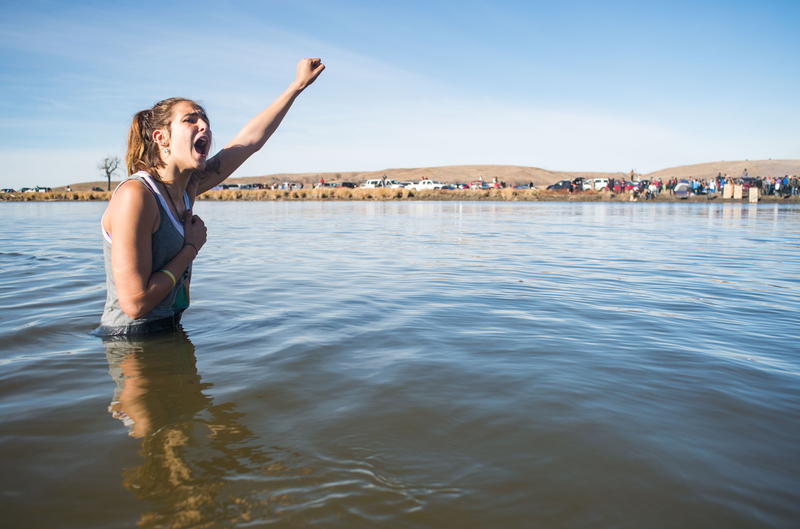 Demonstrator Stephanie Jasper stands in the Cannonball River during a standoff with police at Turtle Island, north of the Standing Rock Sioux Reservation. The U.S. Army Corps of Engineers said Monday that it needs more information before it can decide whether to allow the Dakota Access Pipeline to be built along its planned route. In a joint statement by the U.S. Army and Department of the Interior, the Corps announced it had finished a review of the route, and concluded that more study was needed before it could grant the pipeline company the easement it needs to cross under a section of the Missouri River. The pipeline company Energy Transfer Partners is building the pipeline to bring crude oil from central North Dakota, near the Bakken oil fields, down to Illinois. The current route crosses the river close to the Standing Rock Sioux reservation north of Cannon Ball, N.D.
Army Assistant Secretary Jo-Ellen Darcy wrote in a letter to the company and to tribal leaders that, "additional discussion with the Standing Rock Sioux Tribe and analysis are warranted," reported The Associated Press, and that the discussion would include possible changes to the river crossing which could reduce the risk of an oil spill. Protesters have been occupying land in the area since the summer. Members of the tribe have said they are concerned that the pipeline could contaminate their drinking water if it leaks. The tribe previously filed a motion seeking a temporary restraining order to stop construction of the pipeline, on the grounds that the Army Corps did not adequately consult with them about the route. In court documents, allies of the tribe alleged the pipeline route goes through sacred sites, and argued the tribe had not been able to survey the area for cultural artifacts and graves before the route was approved. In September, a federal judge decided not to grant the restraining order, as we reported, but three federal agencies responded to the ruling by saying they would not allow the pipeline to cross the Missouri until until a review was completed. That review, completed today, led the Army Corps to ask for more input from the tribe. As the legal wrangling has gone on, many demonstrators have clashed with police. Earlier this month police used pepper spray and what they called nonlethal ammunition to keep people off private land, and in October more than 100 people were arrested, as NPR's Jeff Brady has reported. Some 412 people have been arrested in connection with the protests, according to the United Nations. The U.N. Permanent Forum on Indigenous Issues has expressed "deep concerns" about the route, saying "numerous individuals have confirmed that there has been little consultation by the federal government related to the DAPL project." Environmental and indigenous-rights groups supporting the protesters were planning to attract attention to the issue with demonstrations outside Army Corps of Engineers offices, along with banks and other locations in multiple cities on Tuesday, according to email press releases from the groups.